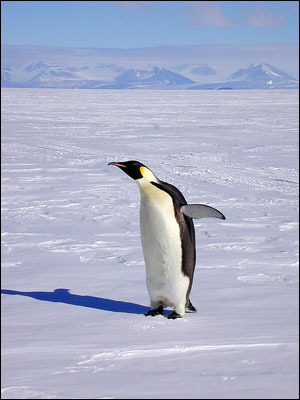 The height of our summer is peak season for Antarctic wildlife, and it is abounding everywhere these days. It is wonderful. 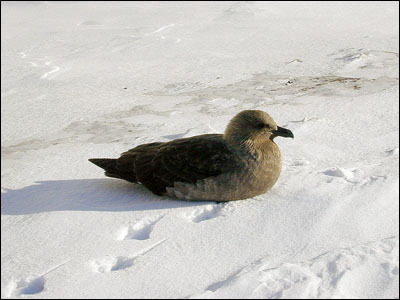 The Great Skua birds are closely related to gulls, but they are more stockily built and brown in color. They are very aggressive birds. 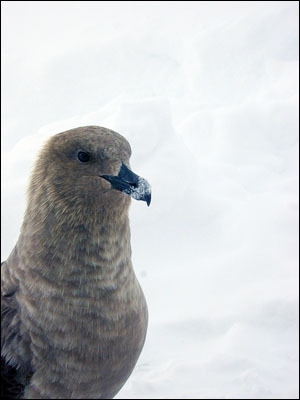 Skuas feed on young penguins, fish and plankton from the sea, eggs and other small chicks, and even other young skuas. They also scavenge through garbage cans around McMurdo. 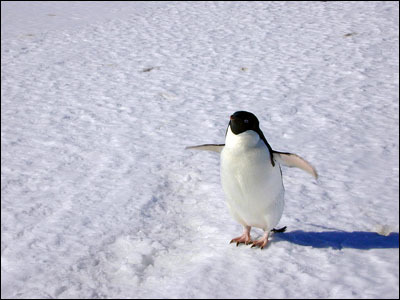 It is against the Antarctic treaty for us to feed them, however, they do not wait around for handouts. If they see food in your hand, they will take it away. 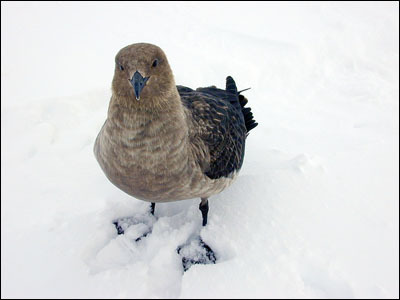 Skuas spend their winter months at sea. It is not certain just how far they travel, but some records show them to have gone as far as the West Indies. They build nests out of pebbles and bones, and will lay two spotted brown eggs, however they generally will only rear the first chick to hatch. They defend their territory ferociously. 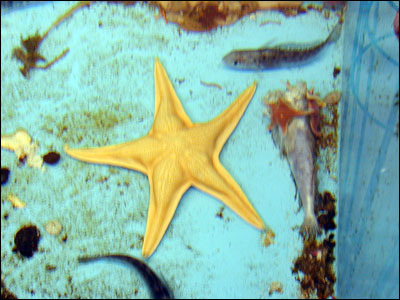 Life is teeming under the ice. The divers are the only people down here who really get an opportunity to see all of that wildlife firsthand. 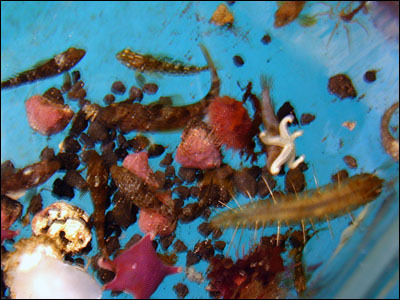 However, many species have been caught and are in our aquarium for observation. I apologize that not all the photos are clear, but I have had a terrible time getting really sharp photos at the aquarium The most popular items in the aquarium are the Antarctic cod. 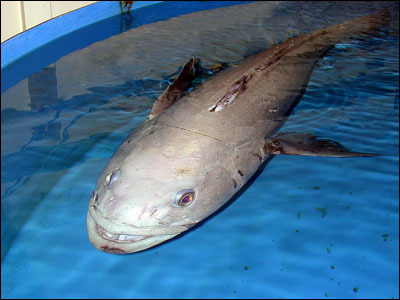 These fish get to be more than 100 pounds. The scientists study them for the antifreeze in the blood stream. 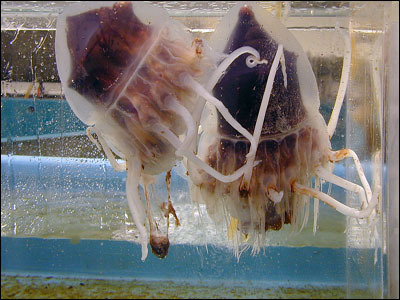 The reason they are so popular is that once they are through studying them, we get to eat them. 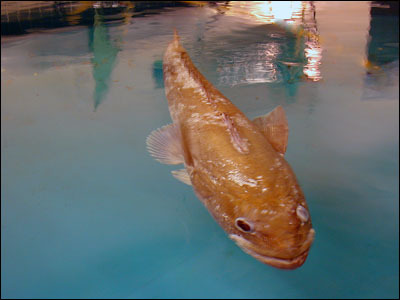 I have to say that this cod is the best–tasting fish I have ever eaten. This season I even had some sushi from the cod cheeks. Delicious! 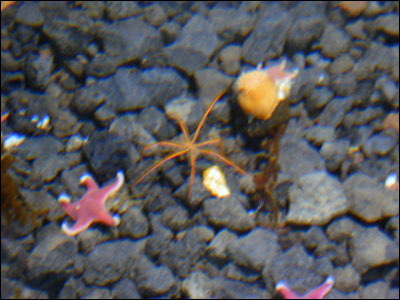 Several other smaller fish are also in the aquarium. Nothing is marked so knowing what things are is sometimes difficult. 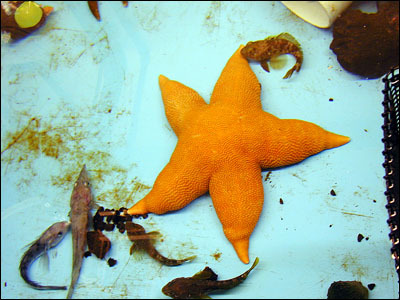 I like the little fish with the curly tail. Some of them curl a couple of times around. 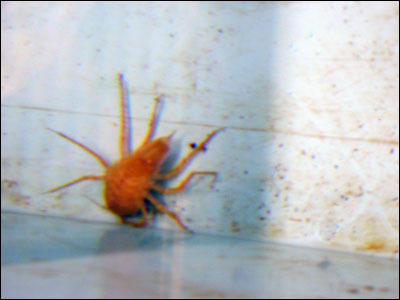 Funny little bug–like creatures appear almost prehistoric to me. 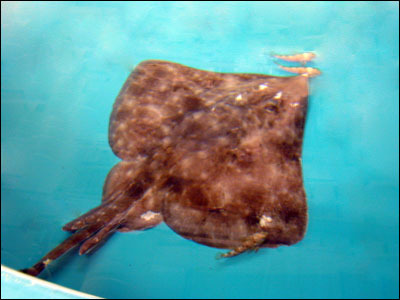 The big news this season is the appearance of a skate — a kind of ray. 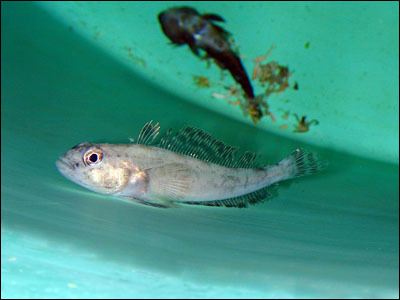 This is the first skate ever caught in McMurdo Sound. 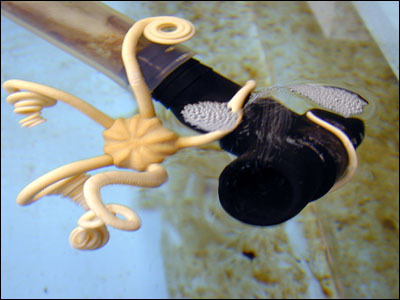 It is possible that they are prevalent in these waters and only the use of a new, multiple–hook fishing technique is what finally snagged them. 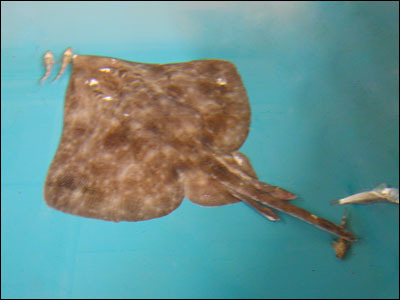 The skate caught here is a male weighing 25 pounds and measuring 3.7 feet long. 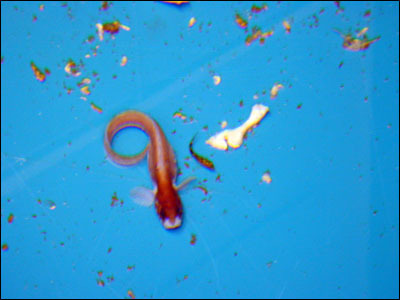 It is possible that this is an undescribed species, but this will not be determined until many more tests have been done. 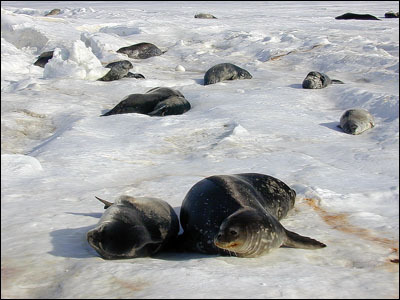 Weddell seals are the most common seals in this area. 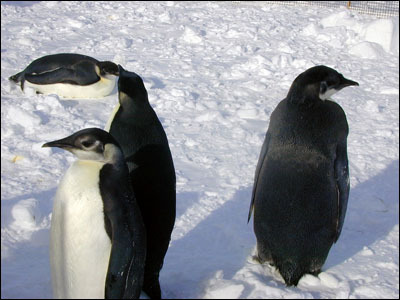 They have a silver–grey coat spotted and blotched with black, grey and white. These seals are among the best swimmers on the planet. 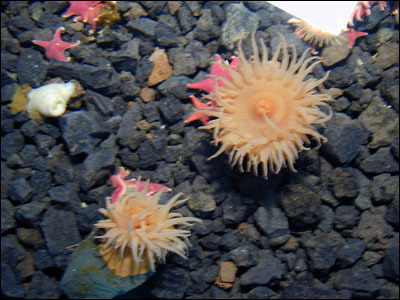 They dive in excess of 2,000 feet, exceed speeds of 6 metres per second, and can stay under the water without breathing for over an hour. 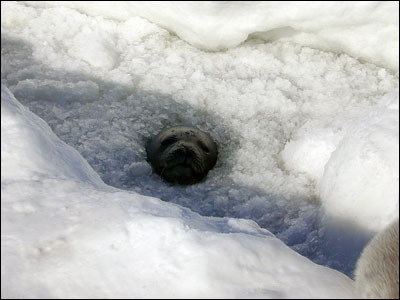 During the winter they live entirely under the ice, chewing holes in the ice to breathe. 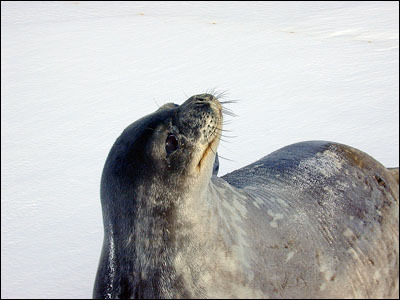 Older seals often have broken and abscessed teeth from several years and grinding and gnawing the ice. 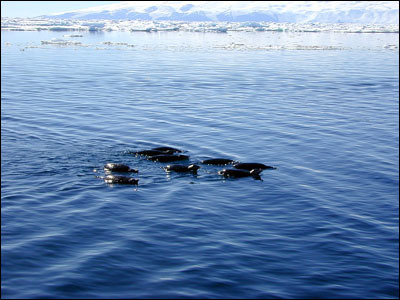 Weddell seals breed under the water. 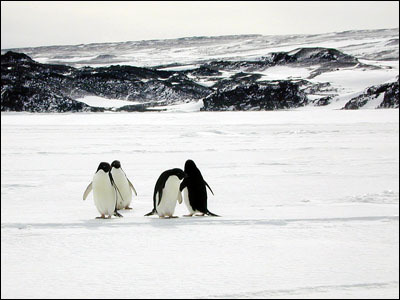 In the summer months they will venture on to the surface and lounge and sleep on top of the ice. There they become lazy and complacent. 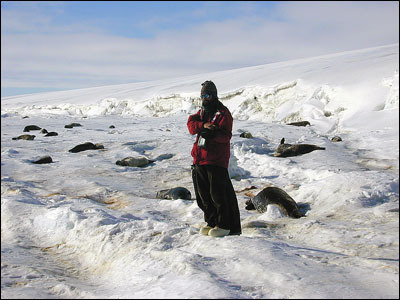 Scientists take advantage of this time to tag the seals. These seals are very unconcerned about humans, rarely responding when one walks by. Occasionally they will sit up and take notice. 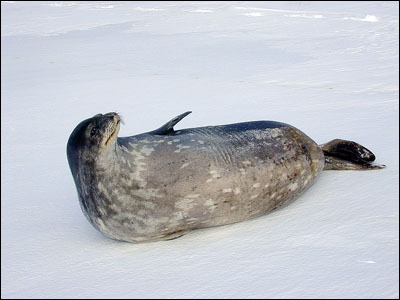 Female Weddell seals give birth on top of the sea ice. 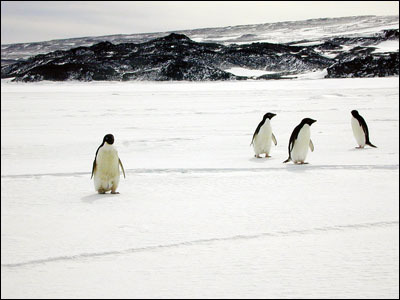 They will stay on top of the ice with their young through the entire suckling period, which means they go without food throughout that time. 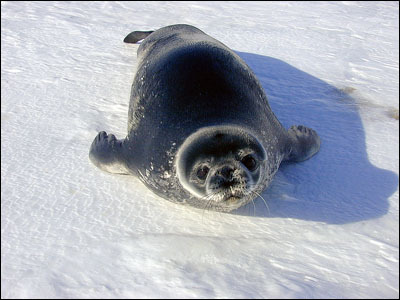 Seal pups weigh 55–65 pounds when born, but they grow quickly. 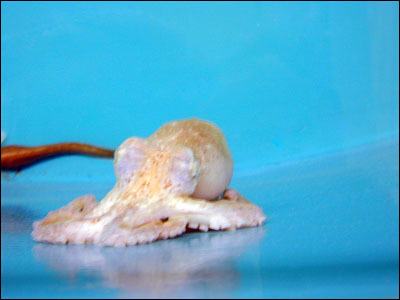 By the time they are entirely weaned, approximately six weeks, they can weigh up to 200 pounds. 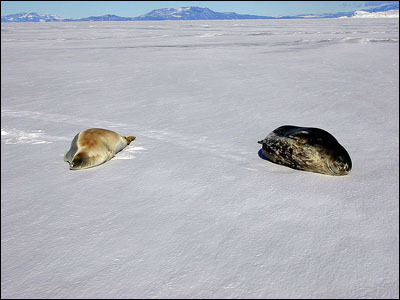 During this time the mother will have lost twice what the baby seals gain. 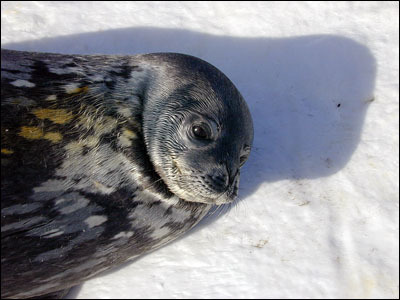 Young Weddell seals take to the water almost immediately and can become independent within two to three months. 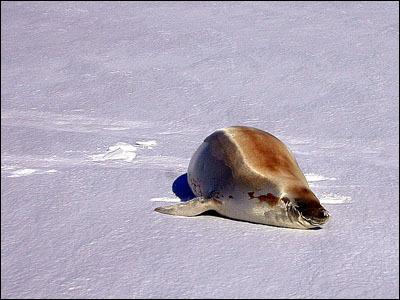 Crabeater seals, while being possibly the most numerous of all the world's seals, are rare to the McMurdo area. 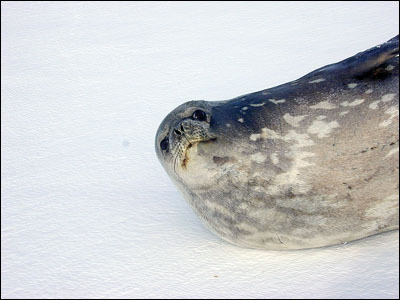 Little is known of this species of seal. 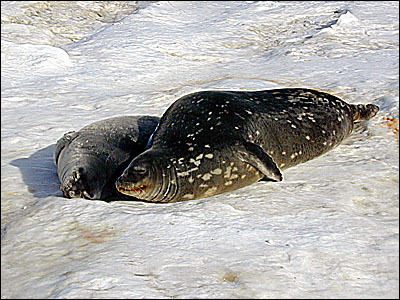 It is suspected that they may be monogamous, which is rare for seals, as they are often seen in small family groups. 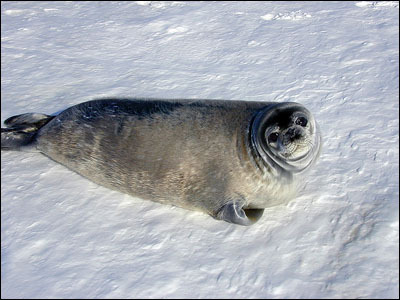 They tend to be much slimmer than Weddell seals, although generally around the same length — 10 feet from nose to tail. 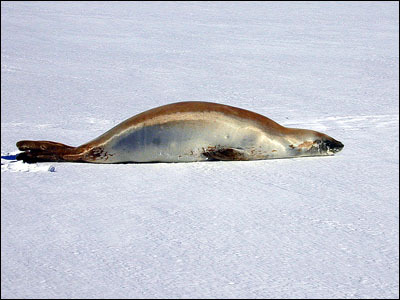 Unlike the Weddell seals that feed on fish, Crabeater seals feed entirely on krill. They are generally grey along the spine, turning to tan along the sides and belly. 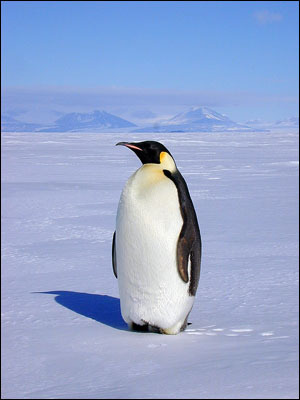 Emperor penguins are remarkable birds. 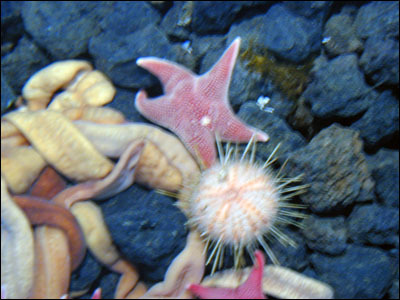 While they are somewhat clumsy on the surface, they are superb swimmers, diving as deep as 1,500 feet. 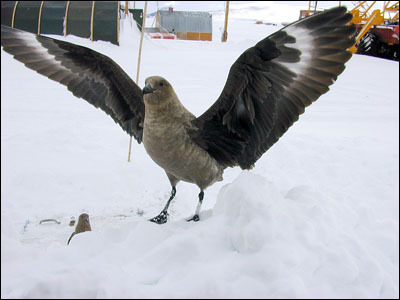 They breed on the pack ice and are the only species of bird that never sets foot on land. 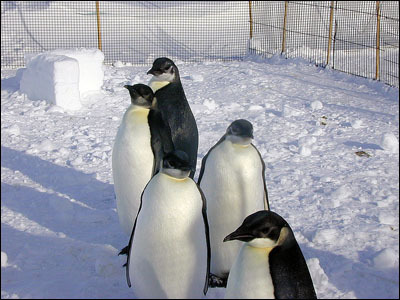 The males incubate eggs for 65 days through the long, harsh winter months, in temperatures as low as –45°C. 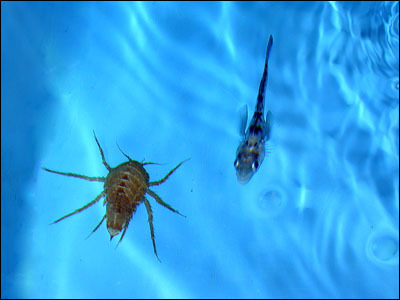 During this time the males fast, losing as much as 40% of their body weight. 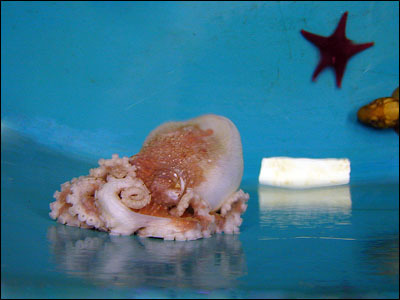 The females spend this time at sea. They return in mid–July, just as the chicks are hatching. Young chicks lose their down and become fully fledged within five months. 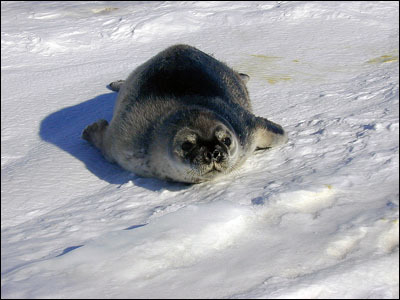 By mid–December they will have reached 60% of their adult body weight. One of the science teams found several emperor chicks that had been abandoned. 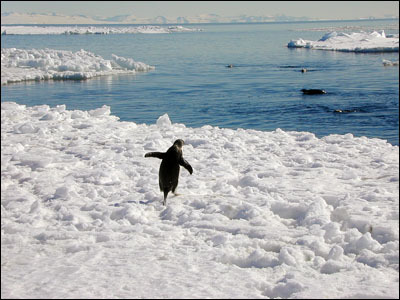 They built a couple of pools in the sea ice where they could raise them and teach them to swim. We had an opportunity to go out and see them. They have 10 young adults out there. 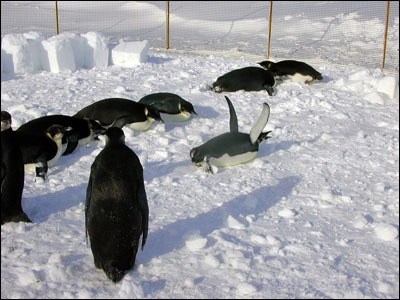 They have already shed their down layer, but do not yet have the coloring of the adult penguins. 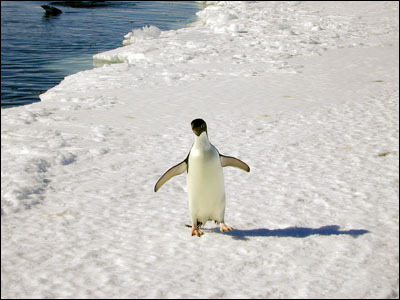 Watching Adelie penguins without laughing is impossible. They are highly animated and childlike in their curiosity. 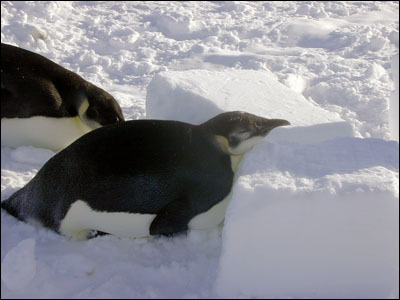 When nest–building in the spring, male penguins find it quite acceptable to steal pebbles and rocks from other Adelie nests, but become somewhat irate when they find they have been stolen from. 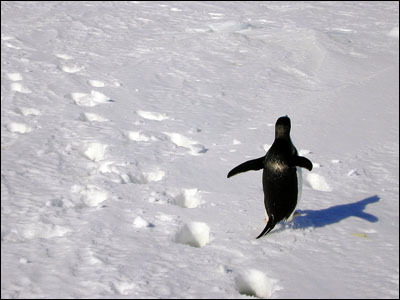 As with all penguins, Adelies are excellent swimmers. 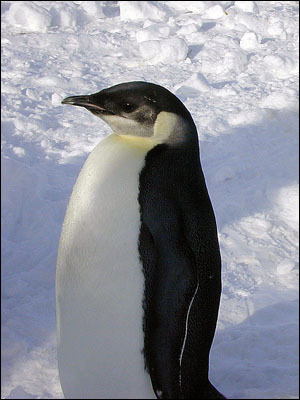 Like Emperor penguins, male Adelies are the ones to incubate the eggs, also fasting for several weeks. 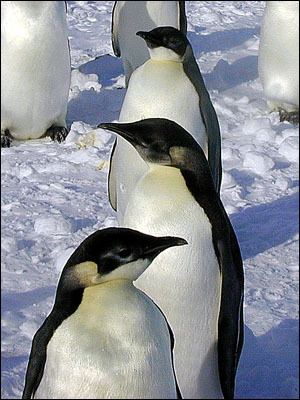 By the time the females return from the sea, the males will have lost half their early–season weight. 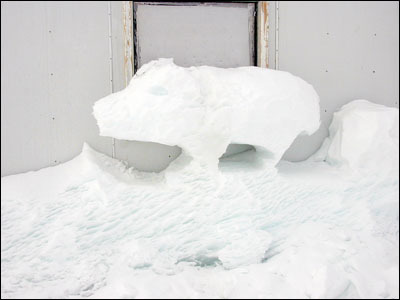 As the sea ice begins to break up, food supplies get nearer. 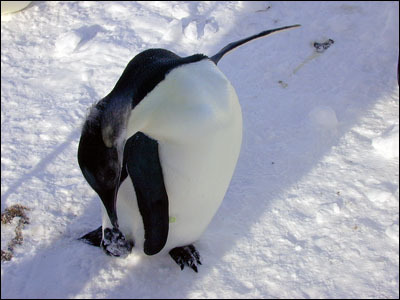 In the last 3–4 weeks of incubation the females will return and alternate incubating every three to four days, allowing the males to seek out food. 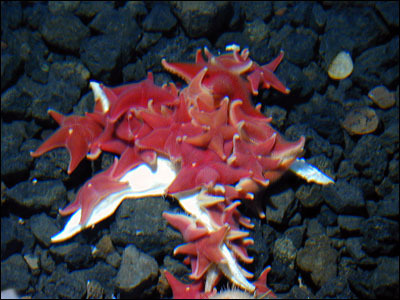 After hatching they continue to share responsibilities, alternating at 3–4 day intervals. It is still a little early to be seeing the whales as the sea ice has not gone out completely. Instead, here is a little wildlife of the manmade variety.